While I was browsing around yesterday researching skydiving and back-up parachutes, I came across a news story from February 2009. It told the tale of a skydiving instructor, George Steele, who died of a heart attack mid-jump. Now, that piece of information alone would have made me sit up and keep reading because, even though I naturally link skydiving and the possibility of death in my mind, I don’t usually think of it as happening due to a heart attack. But the story actually gets far more interesting from there. It turns out this skydiving instructor was not alone when he died. He was doing a tandem jump and had a novice strapped to his chest. Now this piece of information electrified me. 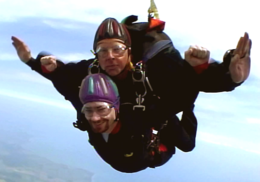 Like a lot people out there, I’ve considered doing a tandem jump (someday) as a bucket list kind of thing. But of all the risks I ever thought might be involved, the instructor strapped to my back having a heart attack was never one of them. By now I’m on the edge of my seat. I want to know more. I have to know more. Turns out the newbie, Daniel Pharr, was a 25-year old soldier trained how to respond in a life-threatening situation. His instincts proved up to the task. The two were the last of the group to jump out of the plane. After a minute or so of free fall Steele pulled the chute. Everything became very quiet, which Pharr commented on, and Steele replied to. And it was shortly after this that Steele’s heart quietly failed. Pharr soon realized Steele had become non-responsive so, going off of what he’d seen on TV (and our mother’s told us TV would just rot our brains) he grabbed the right steering toggle and guided them safely to the ground about a third of a mile away from the designated landing site. This was turning into such great story! Double surprise twist with a happy ending. Dia, I told myself. It doesn’t get much better than this. But wait! she answered. It does! The article had been great up to that point but this part totally knocked my socks off. I was inspired. I was in awe. I couldn’t help but compare what my own response would have been because…well…it just wouldn’t have been as good. I’m self aware. I know my own mettle. I’ve been in enough emergency situations to realize that I’m primarily driven by self-interest. Oh sure. If my kids were involved I’d be a little more noble (as long as they hurried) but otherwise I’d be swelling the herd stampeding for the door. I probably would have been cursing the poor guy for having a heart attack. But not Daniel. Oh no. Daniel was thinking just as much, if not more, of his partner than he was of himself. Pharr’s evolution from victim to survivor to hero was like food for the secret, emaciated Better Person languishing inside of me. He gave me hope, a guiding star. I fell in love with Daniel Pharr on the spot and wished him, wherever he was and whatever he was doing, continued good fortune and everything blessed and best in life. It looks to me like, as deaths go, George Steele got to die a really good one. Yes, he was only 49-years old and sure, he probably didn’t want to die and most likely wasn’t prepared for it. But having said all that, clearly he got to do it doing something he loved. In his relatively short life he’d already done over 8000 jumps. He’s already taken numerous people out for tandem jumps, sharing in the thrill, exuberance, joy, and rush of all those he introduced to his passion for the first time. And even though at the end he was doing a tandem jump, he was lucky enough to be doing it with someone experienced and savvy enough to survive the dangers his sudden death created. Welcome to my world. Those were the last words he ever spoke. I only hope mine will be so great. I’m not happy for George Steele that he died. At all. But I am very happy for him that when he did, he died well. P.S. By the way, when asked Daniel Pharr mentioned he’d be willing to jump again himself, but his family put the kabosh on it. What a guy. Amazing tale! Thanks for sharing that with us. Thanks for stopping by and leaving a comment Lore! If something went wrong….I would have been incapable of pulling my reserve I am sure!!!!!!! Carol!! Hi, hello, and welcome. This was SUCH an amazing story, no? I’m so glad you could see the beauty in it, too. And thanks for leaving a comment. Hearing that someone else is actually interested in this kind of subject matter helps keep me going. 🙂 Lovin’ right back atcha!